Experience the only tour in the Bahamas that allows you to actually scuba dive alongside the beautiful Bahamas dolphins. The trip features a group of especially trained dolphins that will follow the customized diving boat out to the coral reef. Here is where you and your group will jump into the waters with your scuba gear to do two things: explore the amazing and intricate coral reef gardens and play with the dolphins. Certified scuba divers from around the world are already familiar with the excellent scuba diving opportunities available to them in the Bahamas. Many, however, are not familiar with this truly unique Freeport Dolphin Dive! This excursion is exclusively for certified Open Water divers, and it allows these divers to play and interact with the world’s most beloved sea creatures in their natural habitat! The feeling of swimming underwater with these fascinating dolphins is one that is hard to explain in words. Before heading out on the scuba diving trip, you will be instructed on special hand gestures that the dolphins will respond to. These will include spinning around, retrieving items that you hide, and a variety of other tricks that are sure to impress you. These creatures are truly some of the smartest animals around and they love to show that off. This tour is unique for two reasons. 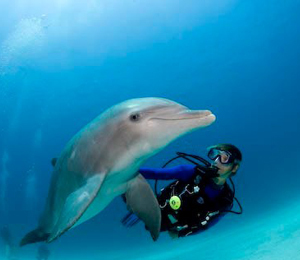 First, it is the only tour in the Bahamas that allows scuba divers to dive with dolphins. Second, it is the only tour where you are able to interact with dolphins in a natural environment. This is the place where dolphins shine. Do not miss your chance of experiencing one of the most unique dolphin swims in the Bahamas! Do you have to be certified in order to participate in this activity? Yes, you must be a certified diver in order to participate in this activity. Does this activity offer transportation? Unfortunately transportation is not provided for this activity. What are the prices for equipment rental? I have been to the Bahamas many times, but Freeport Dive With The Dolphins is one of my favorite trips! It includes everything that everyone should do here. As a Bahamas veteran, I can say only the best about this experience!